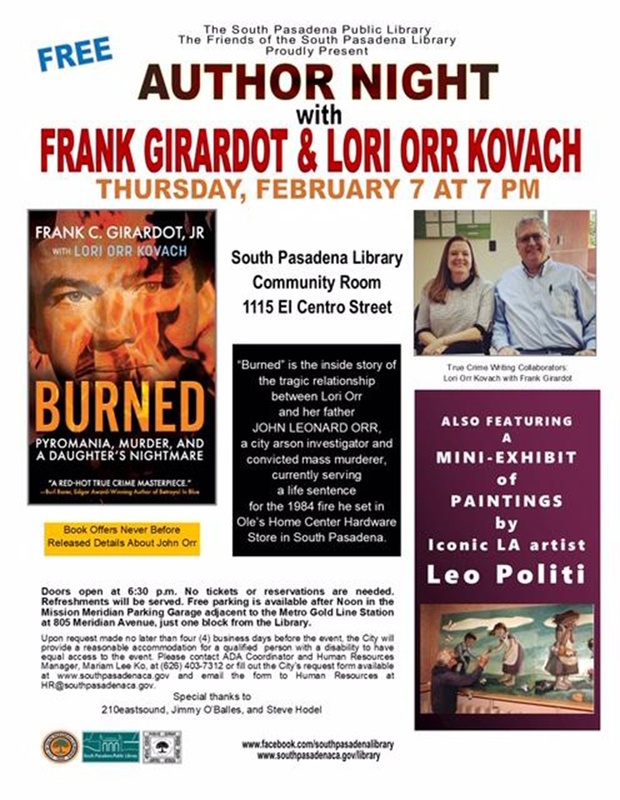 An Author Night showcasing Frank Girardot and Lori Orr Kovach in the South Pasadena Library Community Room on Thursday, February 7 at 7:00 p.m. will also feature a mini-gallery of paintings by iconic Italian-American LA Artist Leo Politi. The authors will discuss their book “Burned”about John Orr, the arson investigator now serving a life sentence for a fire he started in Ole’s Hardware in South Pasadena in 1984 that killed four. In stark contrast to Orr’s, the life of author and artist Leo Politi exemplifies his love for beauty, humanity, and preservation. Politi’s works also show his strong interest in LA’s history and his passion for diverse cultures at a time that predated the multicultural movement by many decades. Politi’s books and paintings captured Los Angeles people, communities, and landmarks, suspending them in time for future generations. Politi challenged the notion of any so-called progress that would be built on destruction of the past and this is still a relevant theme today, perhaps more than ever. Leo Politi was born in Fresno in 1908. When he was six years-old, he and his family moved to Italy where he began his art training. He returned to Fresno and launched his literary career in 1938 with “Little Pancho.” In 1950 Leo was honored with the Caldecott Medal for the nation’s most distinguished children’s picture book for his “Song of the Swallows.” During his long career, Politi also excelled in painting, sculpture, and design. Leo Politi’s twenty books about Los Angeles all became classics and he achieved worldwide fame while becoming known as the “Artist of the City of Angels.” before he passed away in 1996. Since then a public library, a park, a plaza and an elementary school have been named for him. 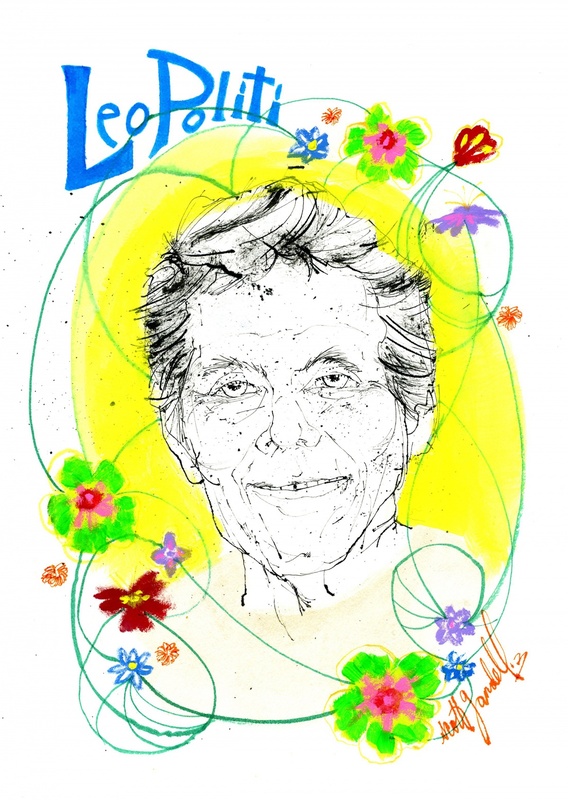 For the centennial of his birth in 2008, many Leo Politi commemorative celebrations were conducted around Los Angeles and beyond, including in South Pasadena where he is especially near and dear. Leo Politi’s earliest remaining public mural is in the South Pasadena Library Children’s Room. He painted it in 1957 for the grand sum of $200, even offering to do it on an installment plan. 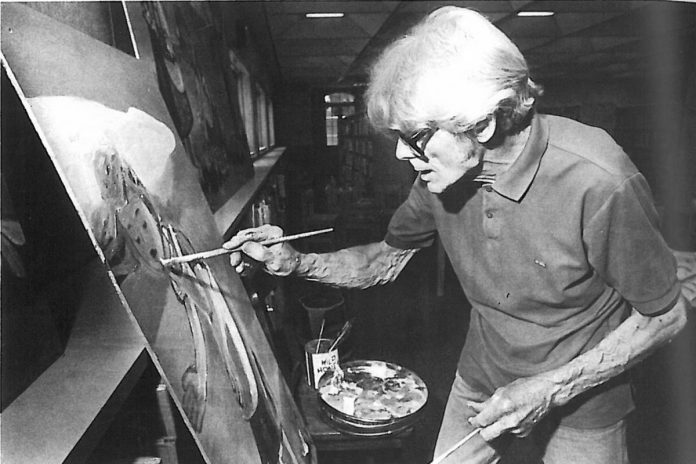 When Leo was asked to touch up the original mural for the grand opening for the Library’s 1982 expansion project, he took on the job without asking for a fee. He planned on spending only 2 or 3 hours, but ended up devoting weeks, almost completely repainting the mural in the process. Politi painted many other famous murals, in public locations including Olvera Street and in Chinatown in Downtown Los Angeles. 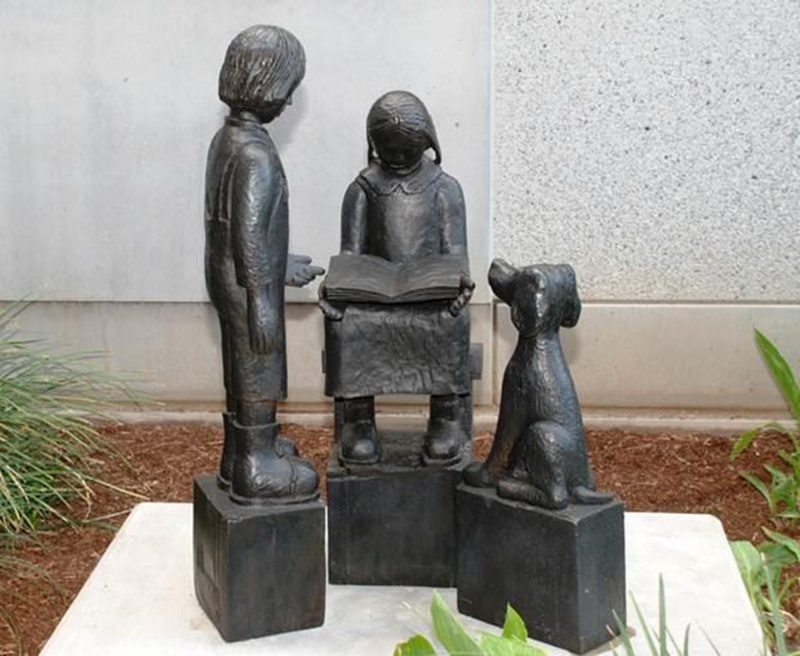 In addition, since 2016 a Leo Politi bronze sculpture entitled “Sister Reading Book to Brother with Dog” has adorned the Oxley Street entrance to the South Pasadena Public Library. The sculpture was commissioned from the foundry of Lester Harries with funds provided by the Discretionary Funds of Members of the South Pasadena City Council, and donations by Ellen & Joe Daigle and Andy Lippman. The South Pasadena mini-exhibit is a prelude to a major exhibit entitled “Leo Politi’s Los Angeles: Works of Love and Protest” at the Italian-American Museum of Los Angeles from February 12-May 19. The Museum show will present a vast collection of original art by the beloved artist. The Italian-American Museum is located at 644 Main Street at the Corner of Cesar Chavez Avenue in Downtown LA 90012, located mere walking distance from Union Station and near the intersection of the 101 and 110 freeways. Admission is free, but the museum encourages donations.